Home Contests Foreign Affairs/Lee Kuan Yew School of Public Policy 2017 Student Essay Competition. Foreign Affairs/Lee Kuan Yew School of Public Policy 2017 Student Essay Competition. Application Deadline: Friday, November 10, 2017, 11:59 PM, EST. In the 2017 Student Essay Competition, a panel from the Foreign Affairs editorial staff and the Lee Kuan Yew School of Public Policy will select one undergraduate’s essay to be published on the Foreign Affairs Web site. Does populism pose a threat to the international order? Why or why not, and what can be done about it? All submissions must be received by Friday, November 10, 2017, 11:59 PM, EST. Open to all undergraduate students graduating no earlier than December 2017. 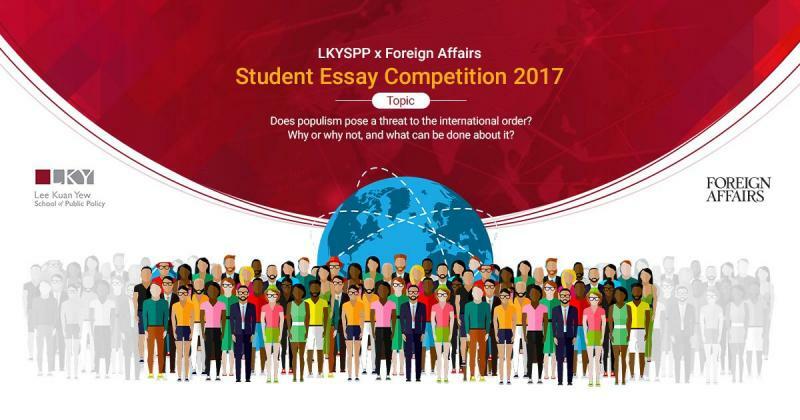 Visit the Official Webpage of the Foreign Affairs/Lee Kuan Yew School of Public Policy 2017 Student Essay Competition. Previous articleSAWISE Hope & Angus Scholarship 2018 for African Women in Science and Technology.